Block 1 & 4N, is one of the stages of Central Park development for Frasers Property located on the corner of Broadway and Abercrombie Street. 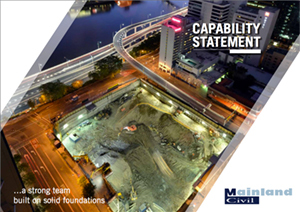 Mainland Civil was contracted direct by Frasers Property to undertake the design and construct of a perimeter contiguous shoring wall including anchors and capping beam. The bulk excavation included 10,000m3 of contaminated fill and approximately 70,000m3 of sandstone. Due to the depth of excavation and perimeter of the hole being adjacent to existing building and roadways the final volume of ripped sandstone was removed using a purpose built steel loading platform constructed to accommodate an excavator.